COLUMBUS — A new Obama campaign ad titled ‘Brian’ has hit airwaves here in Ohio. It appears the ad is quite misleading in its claims. In an advertisement meant to bolster Obama and his bailout of the auto industry, which many financial analysts agree, the large companies involved could have easily rebounded and thrived after a successful bankruptcy filing and restructuring. Slagle says in the ad, “Obama stuck his neck out for us, the auto industry. … He wasn’t going to let it just die, and I’m driving in this morning because of that, because of him.” Really? According to The Weekly Standard’s report, Slagle’s Facebook page (which has disappeared, likely due to privacy changes after information leaked out), Slagle has been employed at Johnson Controls since February, 2006. Of course, Mr. Obama was not in office in February 2006. According to their website, Johnson Controls, based in Wisconsin, “create[s] quality products, services and solutions to optimize energy and operational efficiencies of buildings; lead-acid automotive batteries and advanced batteries for hybrid and electric vehicles; and interior systems for automobiles”. Whether Slagle was employed before or after Obama took office, the question still lingers, why is Obama taking credit for Slagle’s employment? It may be due to the $299 million federal stimulus grant (funded by the tax payers) to build 2 U.S. factories that would manufacture and ship lithium ion batteries to be used in “green” cars as part of the American Recovery and Reinvestment Act (ARRA). Or maybe because Johnson Controls is a supplier to the Detroit automotive companies that actually received that bailout. So what happened with that stimulus? According to a Washington Post report, they opened only one factory, in Holland, Michigan, that is at half capacity. Johnson also announced recently their plans for a second factory to open in… Wait for it… Kecskemet, Hungary! So they’re using federal funds to outsource jobs to Hungary. Wait… There’s more! Johnson Controls plans to lay off an unspecified number of workers at their corporate headquarters, according to the Milwaukee Journal Sentinel. A statement from Rebecca Fitzgerald, the External Communications Director for Power Solutions at Johnson Controls, Inc.says that none of the grant money from ARRA was used in anyway towards the Toledo facility where Mr. Slagle works. 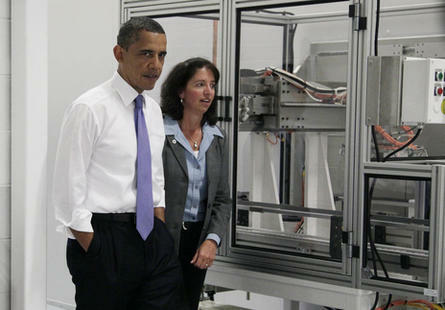 Johnson Controls did not receive federal funding for the expansion of our automotive battery plant near Toledo, Ohio. This plant supplies the automakers directly and is affected by the volume swings of the OE schedules. Layoffs at our plant reflect the impact of reduced demand from our customers, as is common throughout the automotive supply chain. Regarding ARRA, that grant, which was matched dollar for dollar by Johnson Controls, was for Li-ion hybrid and electric vehicle batteries for the development of an advanced battery industry in the United States. This is not related to the plant near Toledo, Ohio. ~Rebecca Fitzgerald, Johnson Controls, Inc.
President Obama is touting job creation at an automotive facility in Ohio, which was probably hurt more by the Obama administration and their failed green automotive movement (See failure of the Chevy Volt). The facility in which Slagle works received no direct benefit from the automotive bailouts, only secondary as they are a supplier. So it begs the question… Should Slagle be deemed an “Ohio Autoworker”? As for the company for which Slagle works, a company that took millions of tax payer dollars, matched it with their own, then outsourced jobs, built a half-capacity facility, continues to lay of workers, and oh yeah… create unsafe working conditions for their workers! The Occupational Safety and Health Administration (OSHA) has fined Johnson Controls $188,600 for exposing employees to high levels of lead at the Toledo battery plant where Slagle works. Bottom line, Brian Slagle has a job, because Brian Slagle went out and got it in 2006. Obama’s green automotive initiative provided Johnson Controls money to expand operations in an unknown and over-hyped market, and now they too are outsourcing jobs, laying people off and having to cut back on production. Why not brag on that Mr. President?